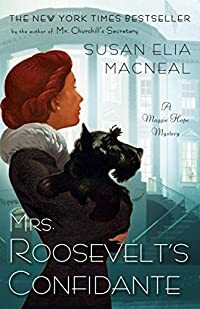 Mrs. Roosevelt's Confidante by Susan Elia MacNeal, a Mysterious Review. Review: It is late December 1941. The Japanese have attacked Pearl Harbor leaving many dead and injured. Prime Minister Winston Churchill of England has come to Washington, D. C. to meet with President Roosevelt in order to discuss how to join forces to crush the Axis power and defeat Japan. Maggie Hope, a cryptographer and spy for the British, is accompanying Churchill and his team on this crossing posing as his secretary. After everyone is assigned to their rooms or hotel, Mrs. Roosevelt tells them her secretary, Blanche, had not shown up for work that morning and she was not answering her phone. Churchill suggests that Maggie fill in for Blanche and assist Mrs. Roosevelt in her needs. Mrs. Roosevelt, a strong willed woman, asks Maggie to accompany her to Blanche's apartment to check on her. Mrs. R. would not be chauffeured. She often drove her own car without the secret police following her, making sure, however, that she had her trusty pistol in her purse. Blanche's car is outside of her apartment, but she does not answer the knock on her door. Maggie, with a hairpin, unlocks the door. They go in to find Blanche dead in her bathtub filled with bloody water. It looks as if she slit her wrists, in Mrs. Roosevelt's Confidante, the fifth mystery in this series by Susan Elia MacNeal. Maggie finds a written "suicide" note accusing Mrs. R. of actions which could ruin her reputation and possibly destroy FDR's chance to continue on as President. Anonymously Maggie calls the police and she and Mrs. R. make a run for it taking the note with them. When it is discovered that Blanche had been murdered, Maggie sets herself up an integral part of the investigation. The clues lead to highly placed men who want to destroy the Anglo/American connection. There is an unending path of twists and turns in this mystery. The confrontations of racism in the north and south raise their ugly heads as Mrs. R. and Maggie became involved in a case of a "colored" man sitting on death row in a Virginia prison having been found guilty of murdering a white man by an all-white male jury. One of Churchill's team is sent to Hollywood with a visit to the early Walt Disney Studios to help plan a propaganda movie. Still another subplot takes place in Germany where Hitler's dream for a rocket is being invented. Finally on to England where German officials are housed in the finest hotels because they are wire tapped to receive information from them. FDR and Churchill are pleased that America and England are allies and are convinced that they together will overpower the enemies. This is a very entertaining entry in this series, with plenty of trivia including FDR's Children's Hour (actually drinks before dinner) and origin of Churchill's "V for Victory" sign. Though a little choppy and a bit all over the place, and the murder mystery itself is rather thin, it is nevertheless a fascinating combination of history and fiction, and it sometimes becomes impossible to know where one ends and the other begins. Recommended for fans of historical mysteries or simply for those that enjoy a good, satisfying read. Special thanks to guest reviewer Betty of The Betz Review for contributing her review of Mrs. Roosevelt's Confidante. Acknowledgment: Random House provided a copy of Mrs. Roosevelt's Confidante for this review.